The Peacock Room | Frame and register door for slow combustion stove. Frame and register door for slow combustion stove. 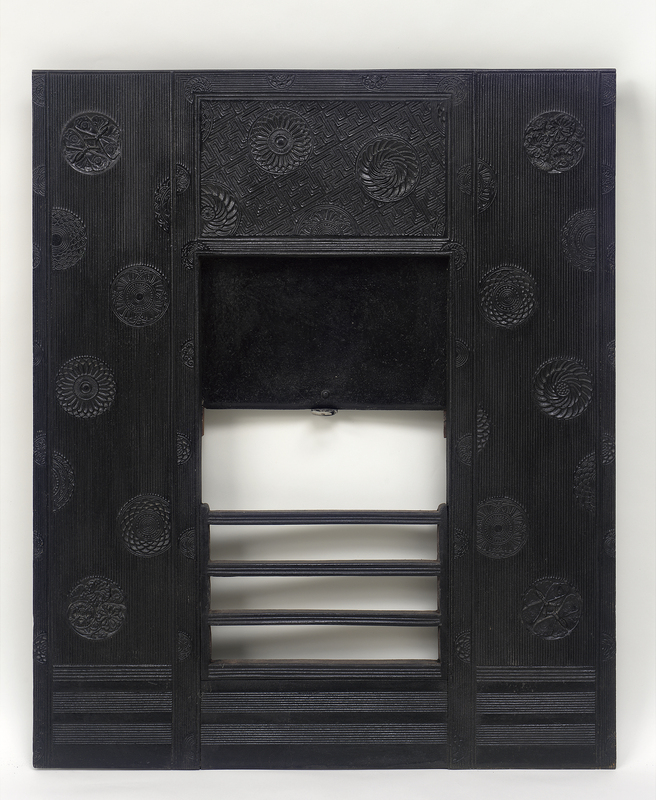 This decorative frame and register door for a slow combustion stove is made of cast iron. Its ornamental motif of roundels enclosing Japanese-inspired flowers and insects on a patterned ground echoes the patterns on room's shelving spindles and on the frame surrounding The Princess from the Land of Porcelain, which hangs directly above the fireplace. The designer of the surround, Norwich architect Thomas Jeckyll, had begun producing metalwork designs for a local foundry, Banard, Bishop, & Barnards, around 1859. His first design for a fireplace surround like this one was registered in 1873, and a version identical in form to this one appeared in the 1878 catalogue of Barnard, Bishop, & Barnards, where it was listed as no. 682, available in "Berlin blacked," "electro-bronzed," or polished brass. These were immensely popular in the 1880s, frequently used by leading Aesthetic Movement architects such as Norman Shaw and praised by tastemakers for combining beauty with utility. When Charles Lang Freer purchased the Peacock Room in 1904, most of its original furnishings had been removed. This piece, identical to the one that was in the Peacock Room in London, was acquired by the museum in 1976. Thomas Jeckyll (1827-1881), "Frame and register door for slow combustion stove.," in The Peacock Room, Freer Gallery of Art, Smithsonian Institution, Accession No. FSC-M-16, Item #3067, http://www.peacockroom.wayne.edu/items/show/3067 (accessed April 19, 2019).